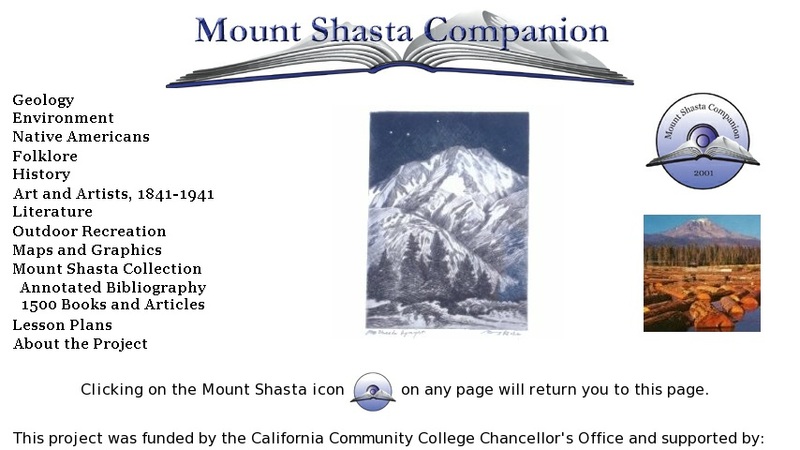 The Companion is a collection of information regarding northern California's Mount Shasta. The overall objective of this project is to develop a resource that can be used to provide information about Mount Shasta while enhancing the study of the sciences, humanities, social sciences, and the environment. To that end, the Companion offers several topics to choose from: geology, environment, Native Americans, Folklore, History, Art and Artists 1841-1941, Literature, Outdoor Recreation, Maps and Graphics, and the Mount Shasta Collection. The site offers comprehensive in-depth detail on each of these topics. Of special note is the Mount Shasta Collection, the largest repository of information and documents about Mount Shasta, located at the College of Siskiyous library. The collection consists of thousands of books, articles, manuscripts, photographs, maps, prints, and audiovisual materials, some of which are highlighted and searchable on this website. The Companion also highlights a 'Lesson Plan' option where teachers can submit lesson plans regarding the Mount Shasta area. In general, the Companion is well illustrated, thus users can study photographs and other various images while reading the accompanying text.